Peace of mind for your guest's valuables! Coat check tickets work well for personal & professional events such as weddings, birthdays, work parties, concerts, water parks. We’ve seen lots of our customers pick this option as they allow for more organization and control over your guest’s items. Not only will you have peace of mind, but your guest can walk away happy knowing that they will be able to retrieve their coat with ease. 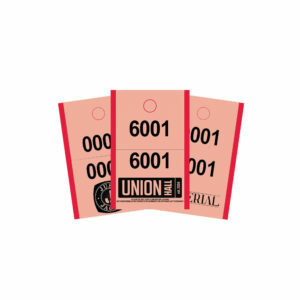 Whether you’re hosting a corporate, social or non-profit event, coat check tickets are a great tool to manage the personal items of your guests. Keep tab of any coats or jackets and see your guests leave knowing that they’re in a safe place. Made from high-quality, medium-weight ticket stock, our coat check tickets are printed using 300 DPI thermal printing. They come with full image/logo integration and custom numbering for added security and are available in 4 colours. Fully customizable, you can either submit your own designs or let our expert designers help you create something fresh.